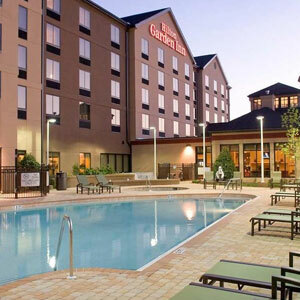 Hilton Garden Inn Pensacola Airport near the Medical Center of town, is located just off Interstate 110 in the bustling Cordova Mall business and entertainment district, one mile from Pensacola International Airport. Enjoy the convenient location of our hotel in Pensacola, Florida, near the three local hospitals and 10 minutes away from the attractions of downtown Pensacola. Make your stay successful at this Pensacola airport hotel with its range of carefully considered services and amenities. Get the job done with complimentary WiFi throughout the hotel, 4,200 sq. ft. of versatile meeting space, a dedicated events team, and a 24-hour business center. Take some time to relax and exercise at the outdoor pool with a hot tub and fitness center. Open for breakfast and dinner, the Great American Grill® serves delicious all-American food. Prepare for tomorrow in a cozy guest room with great technology and comforting amenities. Get to work at the desk with complimentary WiFi, remote-printing to the business center, and a supportive ergonomic chair. Kick back with a cold drink from the refrigerator as you catch your favorite show in high-definition on the 37-inch TV or refresh in-room with a snack prepared in the microwave. The Serta Perfect Sleeper – Garden Sleeper III bed offers the ultimate balance between comfort and support for a great night’s sleep. Our junior suites are ideal for extended stays, families, or just for when you want the extra space in a separate living room with sofa bed.